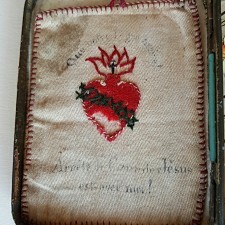 This is a vintage, English cigarette tin that has been made into a portable, pocket shrine. 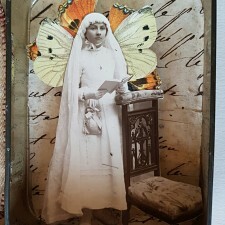 The highlight of the piece is a young girl at her first communion. 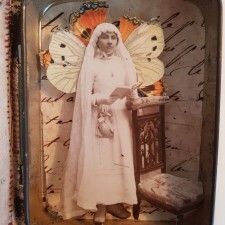 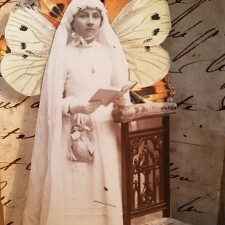 She is from a French photograph circa 1900s and has been set in front of a fragment of a handwritten, French letter from 1848. 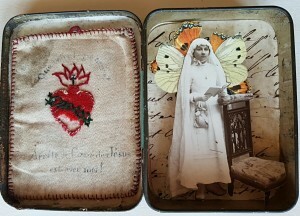 To her left is a vintage textile. 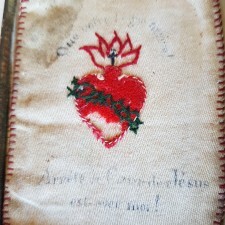 The edges are hand embroidered and it has a felt heart with more simple embroidery and the words “Arréte de Cour de Jésus est avec moi !” lightly stamped. 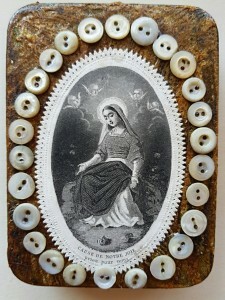 The front has been hand-distressed and embellished with a vintage, French communion card framed with French, mother-of-pearl buttons. 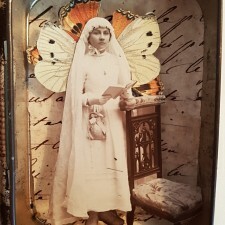 All ephemera is authentic and NOT reproduction. 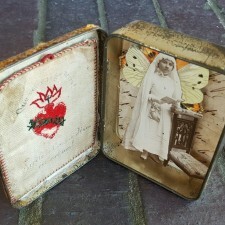 It measures 3″ x 4 1/4 x 1″ (8cm x 10 1/2 cm x 2 1/2 cm). 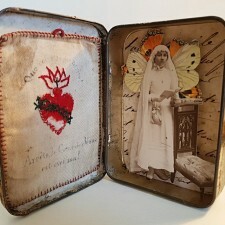 It is lightweight and can be used as a portable shrine for travel or to simply adorn your place of prayer or meditation. 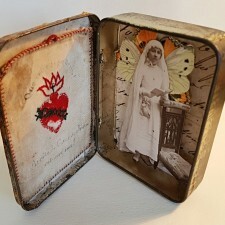 Cost is £65 plus shipping (£4).